As mentioned elsewhere I have recently been on a trip to Adelaide for the Classic Adelaide Rally and whilst there it was inevitable that I would call on Clive and Kevin at Scalex World Raceway. The business operates from a large premises in Ridgehaven and with both Clive and Kevin both being keen slot racers the entire building is devoted to the hobby. There are six tracks in the main area. Five are board and are a mixture of four and six lane and one is a large Carrera circuit. There is also a large Scalextric sports track under construction in what can only be described as the ‘Functions’ room. Most of the latest Ninco stuff is reliveries and as I’m not a collector I decided to give them a miss. Even the JGTC are a little off the pace on plastic tracks against the masses. 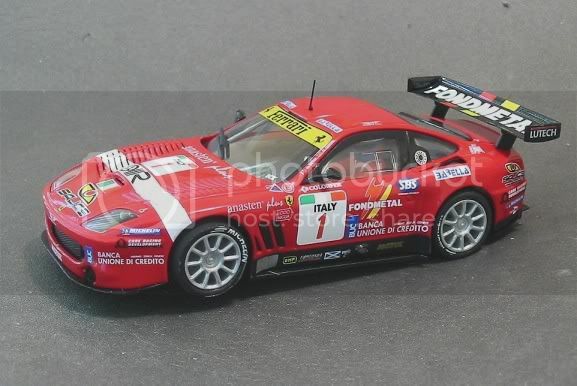 I have most of the Scalex desirables and collectables so no amount of glossy tampo could sway me into duplicating, so after a lot of thought I settled for the SCX Ferrari 550 ‘Maranello’. Why? Well it’s a fairly striking livery when in with the masses, It has a good ‘footprint’ (track to wheelbase ratio) and although I have the Carrera 575 road car it is the model with most potential as far as setting up goes. 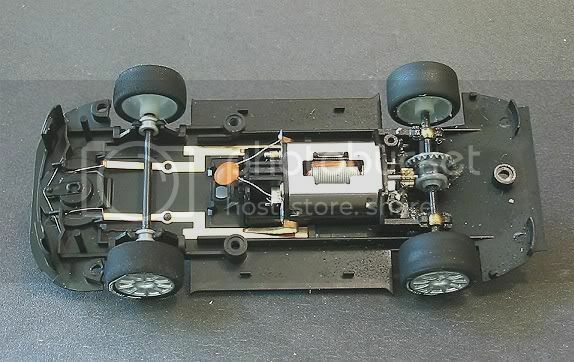 It has a good low C of G and plenty of space between the wheels plus it’s hard to see daylight under the chassis! So at a knockdown price of $39.00 less my 10% red carpet club discount I tucked it under my arm and dreamt of future testing. Once home after the hols the first job was to tear it apart. The body detail is reasonable, I say this as some manufacturers break new ground with their detail SCX are still at their old level. Its interesting to note that when I bought the model, Kevin pulled three out of the display cabinet and gave me the choice. As all were about the same my decision was influenced by the mass of oily fingerprints all over the tampo and clear parts!!! These boxes still had their factory seals intact so I naturally chose the least contaminated. In this age of air born viruses you can’t be too careful!! Or can you? The 550 looks very smart and it is almost compulsory to be red! 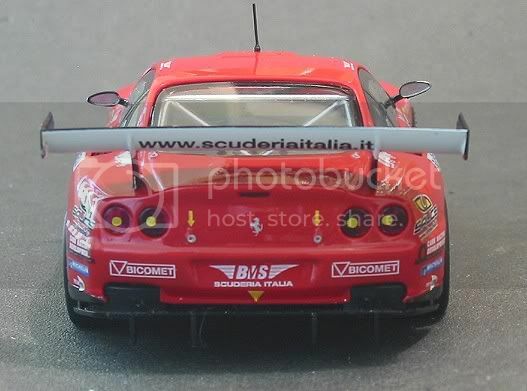 The livery looks to be of an Italian GT series as nearly all the sponsors are Italian. Body detail is picked out nicely and the add on parts are a good fit. The careful use of black has picked out such things as side vents and air scoops. The bonnet has see through louvres up both sides too. The door trims break up what could have been a very red car. Side fillers and doorglass vents too are faithfully reproduced. My one criticism at this stage would be that SCX still DON”T make the vulnerables detachable. The door mirrors and rear wing are both in the line of fire and I am fully expecting them to become statistics. For the purpose of this review I have done some comparisons with the Carrera 575. Simply because they are very similar models The Carrera does have removables and the model feels firm to the grip. The SCX body is a little flimsy and creaks a bit when handled. 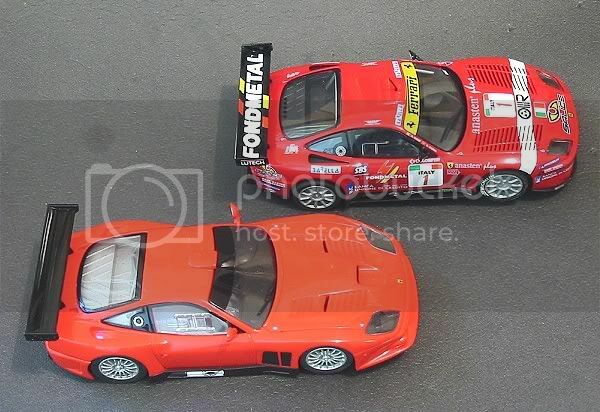 The Carrera looks a nice red on its own but looks positively orange beside the blood red of the SCX. Overall dimensions are very close with the SCX being a little wider on axle width but slightly shorter on wheelbase. Both have a good level of detail and side by side are comparable. The body has five mounting screws which include two dubious ones directly in front of the front wheels. In reality it should be possible to discard one pair of these. 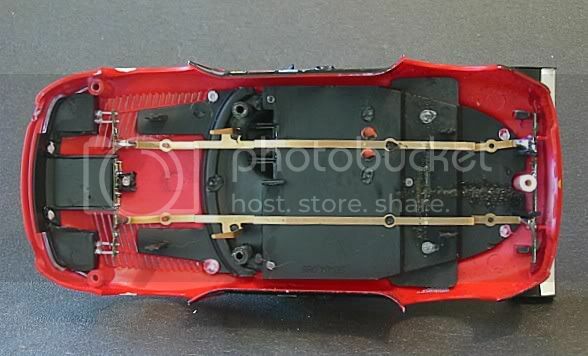 Once the screws are out the model comes apart easily to reveal what is by now a fairly standard SCX layout. The motor and final drive are mounted on a semi floating pod which allows the partial decoupling of the body weight from the drive train. The rear axle is held in the pod by two ball type axle bushes. These make contact with a couple of extension mouldings inside the rear body which limit the pod movement when the body is on. The brass strips for the motor and lights are well fixed down and the very effective light set up is very neatly mounted inside the body front and rear. I was impressed too by the heat welding of components inside the body. Of late I have had a selection of models where the heat process has been carried out rather over exuberantly resulting in severe melting of some delicate components with the potential for these parts to work loose after a few deslots. The front axle was the first area of concern. SCX are mounting their axles fixed and using a sprung guide which is not a problem but with this model the front bushes were tight in the chassis but the axle was VERY loose in the bushes. One of the bushes had a pronounced eccentric axle hole also. As the car runs on its front wheels it shouldn’t be too much of a problem but it is not something I like to see. At this point I haven’t determined whether some of the earlier bushes can be substituted. The guide too is always a source of anguish for me. SCX have devised a good self centring, sprung loaded guide which works well but have let it down badly with poor tolerances in the parts. The result is a guide which flexes front to rear quite considerably and side to side even more so. It must tilt by at least 10% from the vertical! I am suspicious that this will contribute to premature deslotting when hard pressed into bends. The cure is fairly simple but really unnecessary. The bush which locates the guide and has the centring spring attached is removed. The outer mating surface on the bush and the chassis hole are both coated in a thin layer of superglue using the tip of a modelling knife. When dry (20 mins), the two parts are offered together. The process is repeated until the bush is a snug fit in the chassis. This usually happens with the second application. The guide itself can have super glue applied to its sliding sides and sanded or filed back if you want to make a really snug fit. Parts are lubed with Vaseline on reassembly. The next defect which I considered to need attention was the front to rear movement in the power pod. At its rearmost position the rear wheels almost touch the back of the rear wheel arches. The cure for this was a small round shim made of plastic card placed over the rear pivot pin helping to keep the pod in its forward most position. Finally the tyre problem had to be addressed. Well if you don’t know by now, the problem is a severely concave tread area! This will need mammoth sanding! Or will it? The rear tyre defect is caused by the retaining ridges on the outside walls of the tyres being TOO DEEP! Consequently, when the tyres are in place the tyre walls stick up more than the tread area leaving the tread to sag in the centre. My cure for this was a simple two minute job but maybe not available to every one. If you have a Dremel type hobby drill, you will have some attachment sanding drums. These are cylinders of coarse grit which are mounted over a rubber drum on a spindle. The centre screw on the spindle compresses the drum which in turn grips the grit tube. I inverted the tyres and placed them snugly over the grit tube. This causes the sidewalls to be exposed. I then spun the drill at a low speed and with a fresh bit of 250 grit emery, sanded down the sidewalls. Testing the tyre on a hub as I went along I eventually ended up with a pair of rear tyres which were an almost perfect fit. Final sanding would be on the tread area to true that to the wheels. My final mods were to bed in the contrate. SCX gears can be noisey so a ten minute work out on my test track at home with some Tamiya fine on the final drive was carried out. After, the motor was removed and the endbell detached. The reason for this is that SCX RX motors are amongst the poorest when it comes to QC. The biggest defect is an eccentric commutator so the armature was mounted in my drill press and the comm. trued with a thin strip of 1200 wet and dry. The motor was lubed and reassembled and reinstalled into the pod. The final drive was lubed with Vaseline. So on to track testing. As I have already made modifications to this before its first test it isn’t possible to give it a true SOOB test. Taking into account the two or three mods I have made, based on previous tests I would estimate that it would have made a difference of about 0.5 secs over the 21 metre lane compared to stage two mods. This would have placed its SOOB time at about 8.3 seconds on Red lane of the local board track. Not too far away from previous SCX model tests. So onto the red lane. The track as usual will have had an hour or so’s use and be up to maximum grip. The car takes off well and it is immediately apparent that it is going to be well behaved and a good drive. After settling in with it I set the practice period to twenty laps and a big Murray Walker “WOOOW” wav file was attached to the fastest lap mode. This removed the necessity for me to look up at the monitor whilst driving. Red lane has a fastest lap of 6.9 secs for the SCX pre magnet F1 Jordan and all the rest fall in behind this. 7.3’s are a good competitive time and 7.5’s can be winners if you don’t deslot. The first test provided a fastest lap of 7.864 secs. Not bad for stage two SCX but to be competitive it was going to be necessary to squeeze a few more pips out. Tyres were sanded again but no improvement was made. The model was handling well and its square footprint was evident in its rock steady cornering. Not too much tendency to drift but still a little. The model was very quiet and this tells me its not using too much energy making noise. The RX 42 is a steady plodder and most of the cars time will need to be found in the corners. Time for Stage Three. During a lull in the evenings events between racing Scalex Williams FW 07’s and Brabham BT49’s and pushing a couple of Ninco Classic 20 X 7 shod Formula Juniors through the sound barrier I set the car up for its Stage Three test. The tyres had one more quick buff and the body screws were backed off till there was a degree of free play. The tags which take current to the lights were still giving a bit of spring in the body but this was minimal. The tyres were given the hydrocarbon treatment and the model was placed back on Red lane. To my surprise the tyre cleaning made little difference to tyre performance. In actual fact it caused a bit more slip if anything. This causes me to suspect that SCX have used a different rubber compound for the rears? I left off cleaning the tyres and buffed the last remnants of uneven tread from the tyres and returned the model to the track. I ran it for another few minutes upon which it felt to drive better through corners and and took off a little quicker down the straights. The motor too seemed to loosen a little so I reset the practice timer and set off on another twenty hot laps. Sure enough, lap after lap, Murry chimed in with his distinctive WOOW telling me each lap was quicker than the last. Finally, after Murray became silent for longer and longer, the Clapping of the “Race Over” file kicked in and I stopped to look at results. Sure enough, I had managed to knock the best lap time down to 7.537 secs. This wasn’t going to be improved by much so I settled for this time as its best. Out of curiosity, I treated the tyres again and sure enough the lap times became slower ? What have SCX done with the rubber? Who knows? But it’s not the good old board hugging stuff of their previous offerings, that’s for sure! Wheelbase.........		78.0 m.m. 79.5 m.m. Front Axle width. 63.0 m.m. 59.0 m.m. Rear Wheel Dia..		21.0 m.m. 22.0 m.m. 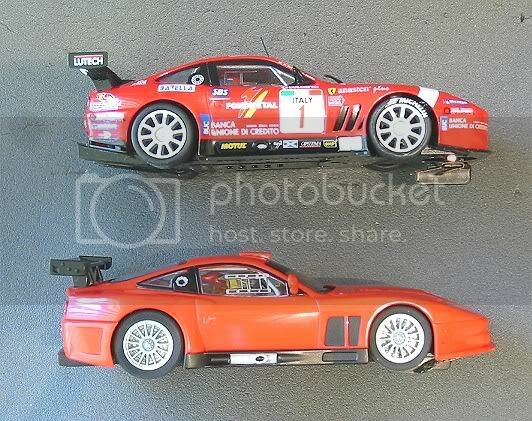 It’s my view that the SCX 550 Maranello can be made to fly with a little work. On board tracks up to 25 metre lap lengths a 10z Ninco pinion will transform it and on plastic tracks of similar lap length careful body tuning and traction magnet adjustment should see it hold its own. On bigger tracks with longer straights it would fall a little short of the mark and a motor upgrade would have to be considered, but how many of us have access to these tracks anyway? Also in light of the strange rear tyre behaviour I would try some other SCX tyre or even one of the Ninco competition tyres. 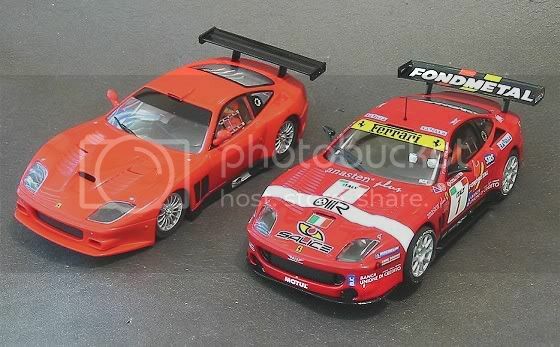 I have several successful SCX cars to date which are able to blitz more thoroughbred models. A Citroen Xsara with pro turbo for board, A CLK Merc with RX41 for plastic, an Astra DTM with RX41 and 10z pinion for board and A Megane rally with Pro Turbo for plastic. All these models have been carefully set up and out perform their SCX stablemates. I’m sure this model will soon be keeping other same class makes honest in the near future. Had the oppurtunity to run this model on the Green lane of Four Seasons SCC last night. Initially I was quite pleased with it and settled in to a steady pace quite quickly. Lap times were about the 6.4 mark which placed it in the Carrera GT group but as time passed the lap times dropped to a best of 6.122 secs. Not bad but it makes it one of the slowest SCX cars (who normally register 5.8's on the fastest lap scale). After checking it out for possible problems such as rubbing wheel arches and dragging wheels it all appeared OK? I'll have to keep an eye on it and see if it improves. The RX42 seemed to be loosing it on the straight alongside other runners but cornering was still amongst the best. Deslotting was usually an attack of understeer when pushing it out of corners and a slight change in driving technique remedied this. So I'll have to nurture this one for a little while to see why it's poorly!! Nice review. Thank you for the tip with glue regarding the excessive movement of the guide, i'll apply it right now !! 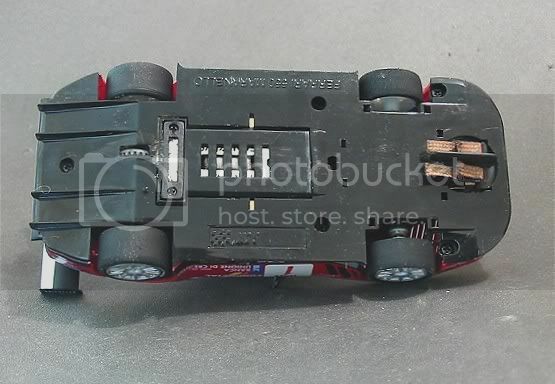 WIX thanks for the tips,Ive got one of these also we race with RX-42Bs on 14 volts with magnets ninco track,as its the highest voltage SCX SOOB are the fastest cars.Ive only changed tyres to MJK capri (carrera it think) and motor as per rules,I tested me old Astin on 10 volts and holding flat chat it still comes off but the maranello doesnt,havent raced the maranello on 14 V yet.